So, I know that there are several newer FCS options and other Kelly Slater Fins that have emerged since the release of the K2.1, but I couldn’t help but write about these awesome fins. First off I haven’t been a fan of FCS fins for years because I would always break them out. Since their new fin plugs, I have become a little more accepting to the fin system in general. One thing is for sure, whether or not you like the plugs, you can’t help but love the different fin options that they have. A couple of years ago I bought a board with the standard G5 FCS fins on it. After breaking a fin plug and losing a fin I was given a set of the K2.1’s from a friend to replace my old G5’s. In case you’re wondering, there is a difference in fins, and this was the first time I noticed. Sure you can tell the difference between big single fins, or twin fins, but sometimes it’s hard to feel subtle differences in size and stiffness like in the K2.1 FCS fins. These fins were designed to work as an all-conditions type of fin, basically make it so you do have to change your fins out at every spot you go to. One thing that I really like about this model is that the middle fin is slightly smaller than the two side fins. The two side fins are a bit bigger and have more flex, which gives you tighter and faster turns. The middle fin, although slightly smaller, is stiffer than the outside fins and is designed to help control the turns and keep them relatively smooth. 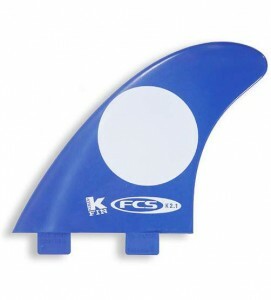 I would not only recommend the K2.1 Kelly Slater FCS Fins, but would also recommend trying out new fin options rather than accepting the standard ones that come with your board when you buy it. Just a little something to think about.